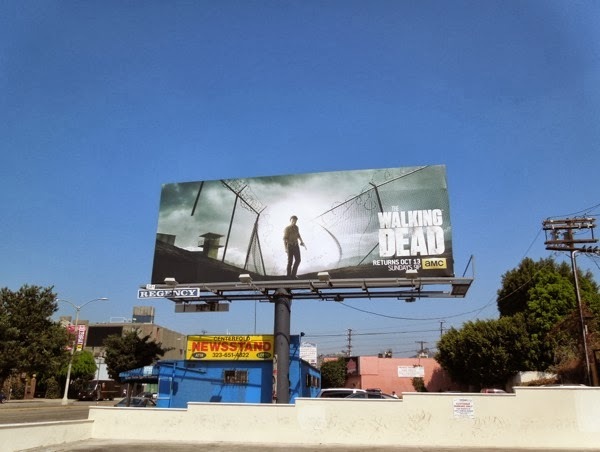 Daily Billboard had goosebumps upon seeing this fourth season billboard ad for The Walking Dead, as once again it captures the spirit of the show without deviating into the gore or shock tactics you'd expect from a series based after a zombie apocalypse. 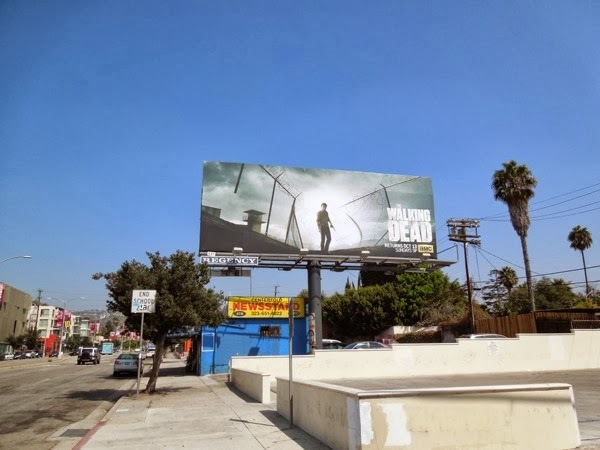 In fact the whole ad campaign for the entire series has been especially atmospheric and stylish since The Walking Dead series premiere billboards back in October 2010, with Andrew Lincoln's 'Rick Grimes' being the main focus of each creative with stormy skies signifying troubled times on the horizon. 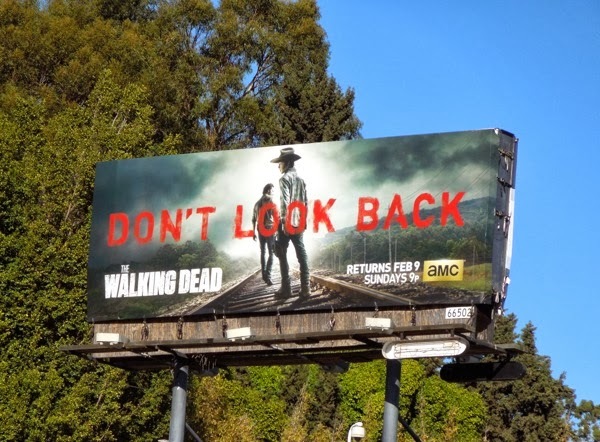 After a bout with madness last season it looks like the former small-town sheriff's deputy is a resolute as ever to protect his ragtag band of friends and family, plus new arrivals from the town of Woodbury. And even though the prison seemed like a sanctuary at the time, it appears that nothing lasts forever and all the fences and barriers in the world can't protect the survivors from the hordes of flesh-hungry Walkers (especially when there may be an enemy within helping them). 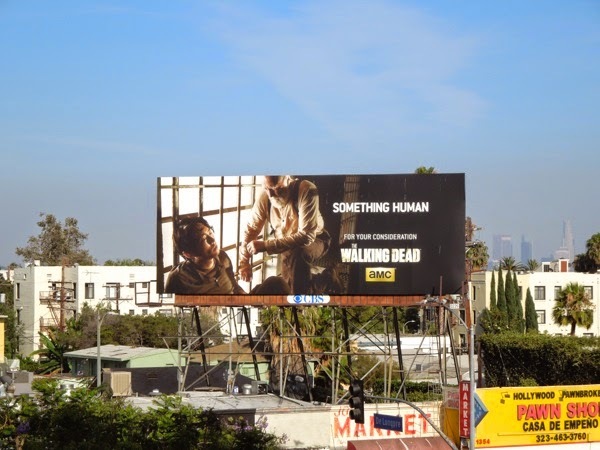 This compelling season four billboard, which just comes a day or so after the announcement of a new spin-off companion series based in Robert Kirkman's zombie-infested universe, was spied along Fairfax Avenue at Melrose Avenue on September 18, 2013. 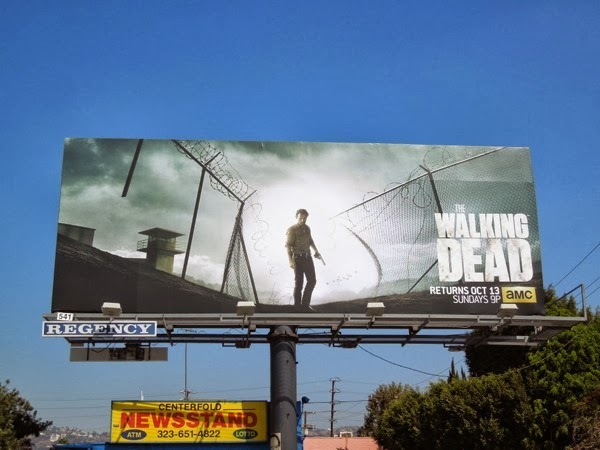 If you like this creative, be sure to check out these equally evocative billboards for The Walking Dead season two and season three billboards. 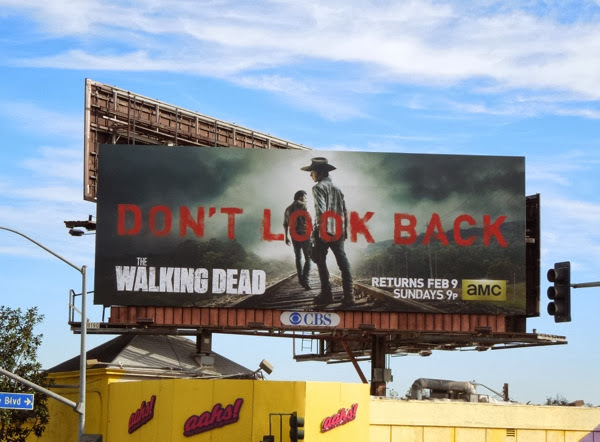 Daily Billboard can't wait to see what's in store for the highest rated, network beating cable show that elevates the horror drama genre to new levels (and can we please see some Emmy and Golden Globe Award recognition in the future). 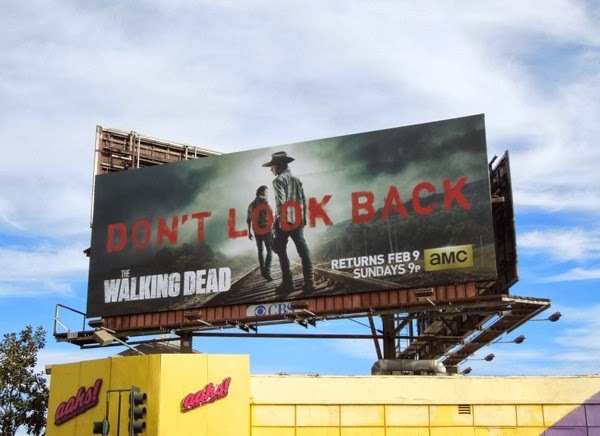 UPDATED: After the dramatic events, and deaths, of the midseason finale at the prison, it looks like there's no turning back for 'Rick' and his son 'Carl' (and the other survivors of their ragtag band). 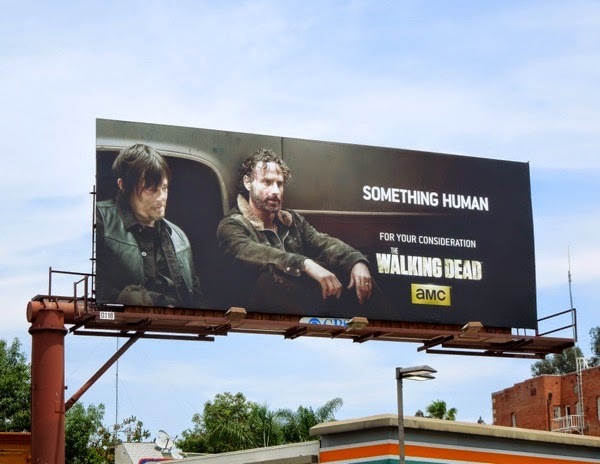 For the first time Rick shares the spotlight with his only son (and possibly only child?) 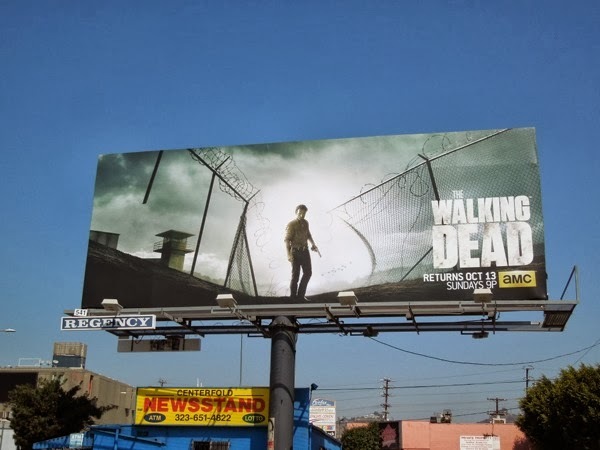 in this promo billboard for the second half of the fourth season of the acclaimed zombie apocalypse drama. 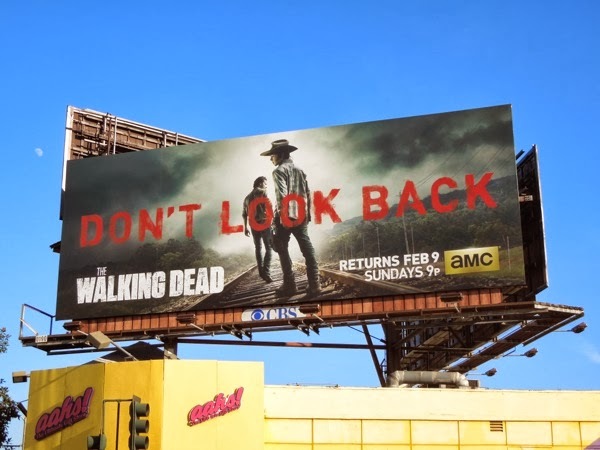 This foreboding ad creative with the bold and bloody red tagline 'Don't look back' (again a first for The Walking Dead season promos) was spied along the Sunset Strip at San Vicente Boulevard on January 6, 2014. And here it is on a clearer January 10, 2014. 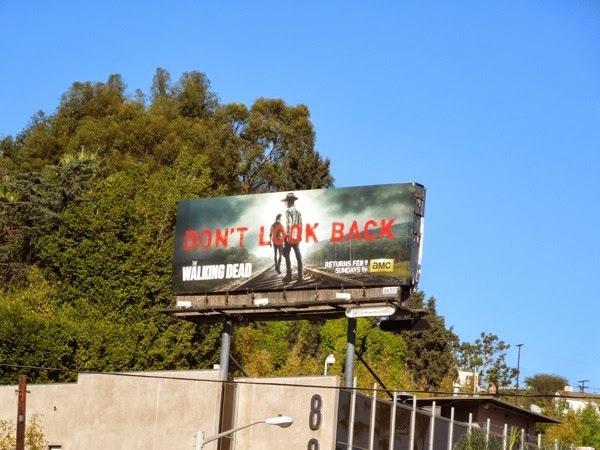 UPDATED: Here's also smaller version of the midseason billboard, spied further east along the Sunset Strip on January 13, 2014. 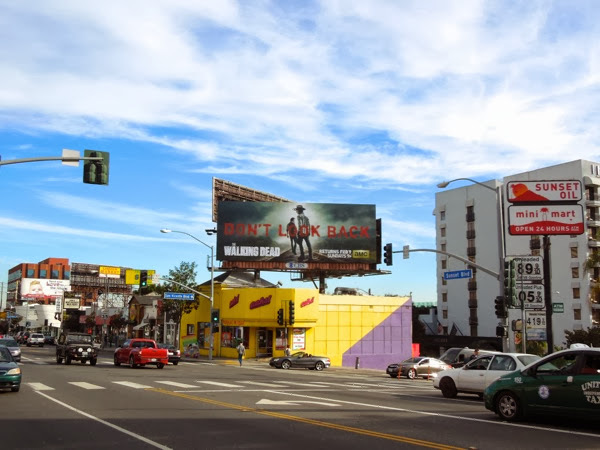 There really is no looking back for this horror drama, which continues to go from strength to strength. 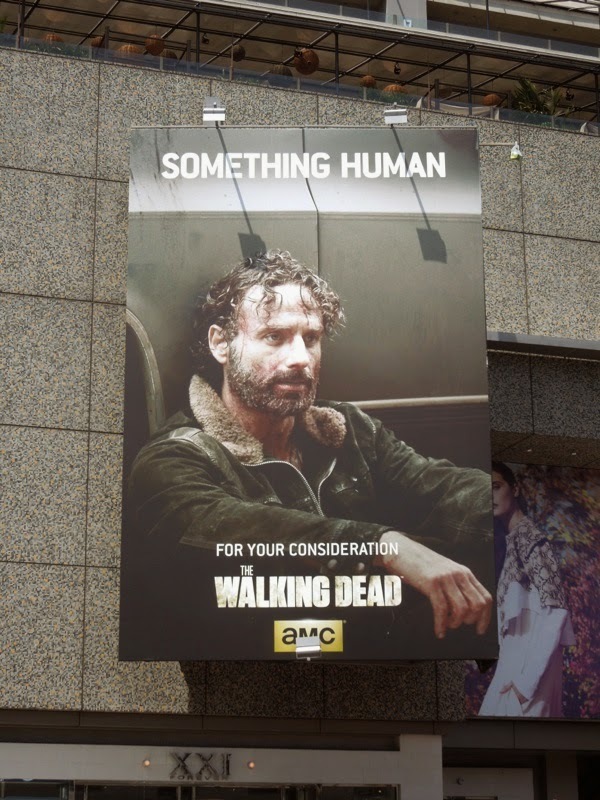 UPDATED: Following arguably the most shocking and exciting season of The Walking Dead so far, AMC is supporting the critically-acclaimed apocalyptic zombie drama with a fantastic Emmy Consideration outdoor ad campaign. 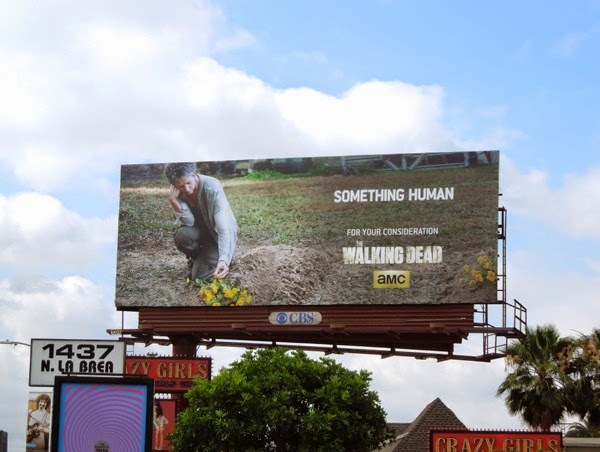 Let's hope these compelling billboards featuring the cast in key moments from the season, be it 'Carol' kneeling graveside after being forced to make another devastating decision, 'Glenn' and 'Maggie's' emotional reunion, or bonding moments for both 'Rick' and 'Daryl' and 'Glenn' and 'Hershel', can convince Emmy voters this phenomenal series is more about human drama than just a gore fest. 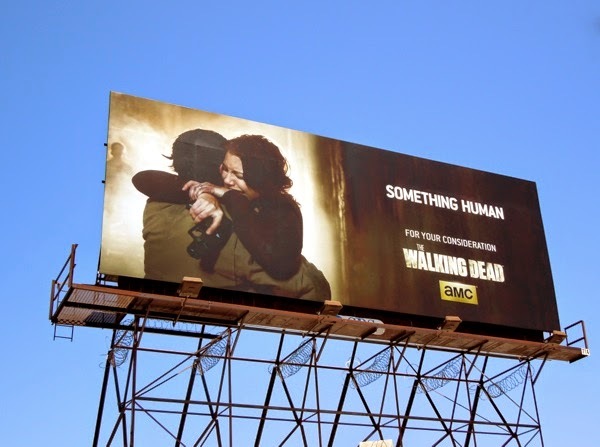 This 'Something Human' ad campaign was snapped from May 19 to June 2, 2014 around the streets of L.A. and Daily Billboard thinks it's nice to see some of the other cast members sharing the spotlight in the skies with Andrew Lincoln after four seasons of him dominating the season promo billboards.